The St. Helens City Council voted 4-0 to approve a street vacation request Wednesday, Dec. 5, that had been submitted by the city's mayor and a co-owner of several parcels of property on top of a bluff at Wyeth Street. Mayor Rick Scholl excused himself from voting on the decision, as well as deliberations. Wednesday's vote came after months of discussion with the St. Helens Planning Commission and City Council about whether or not to approve the vacation request from Scholl and St. Helens insurance agent Rob Schlumpberger, who co-own several pieces of property on Wyeth Street and 9th Street. 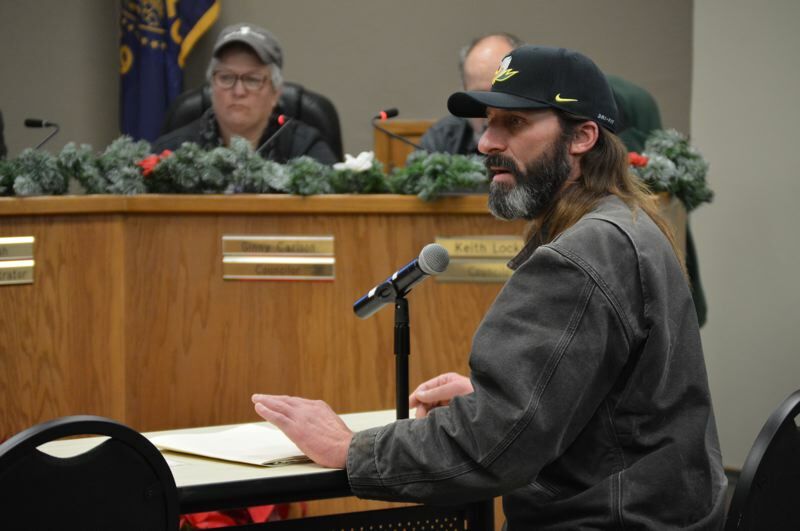 A small crowd of about 10 people gathered for the continuation of a public hearing before the council made the final decision to approve the request Wednesday night. No one spoke in favor or opposition, but one audience member asked a clarifying question and at least one written letter was submitted to the record. When calling for a vote, Councilor Ginny Carlson noted that city staff and the applicants had adjusted their request to accommodate neighbors' concerns, while Councilors Keith Locke and Susan Conn saw the vacation request as a way for a difficult piece of property to be developed. Council President Doug Morten echoed those statements and commented on how the mayor had "asked for no favors, and (the council) gave no favors" in the process. "The mayor has every right to develop that property, just like any other citizen," Morten said. "The mayor, in this sense, is just like any other citizen." The properties present difficult geographical features, which make building on the land difficult, especially when it comes to access roadways. Initially, Scholl and Schlumpberger requested a vacation that would essentially connect all of the parcels, but city staff did not recommend approving that vacation. Instead, staff presented the council with a design that leaves an alleyway access 20-feet-wide between the properties, instead of the standard 60-feet-wide roadway that city code calls for, which would still allow emergency access. In September, the City Council held a public hearingregarding the vacation request. The council ultimately decided to postpone a final decision until all council members could visit the property. The hearing was left open until Wednesday. At the September hearing, numerous residents cited concerns about the vacation request. Scholl and Schlumpberger first approached the St. Helens Planning Commission in August with the vacation request, and after two meetings of discussion, the commission recommended the City Council approve it. The City Council is typically the governing body that approves street vacation requests, but Scholl said in August he presented his request to the planning commission to be more transparent in the process. After the council vote Wednesday, Scholl commented about the process. "It's been a long road and I've been as transparent as I possibly could," Scholl said. "It's been a learning experience. When people talk to me about their frustrations, I can empathize, but I understand the process." Scholl has consistently stated that he began the process of trying to build a home on the Wyeth Street bluff before he was mayor and the street vacation was just another step in the process. Columbia County property records show that Scholl purchased one lot of land in March 2017 by himself and two other lots in January 2018 with Schlumberger, however. Scholl took office in January 2017.